Last Week in Review: February Housing Starts jump, while the Fed statement gives markets a boost. Forecast for the Week: Will Existing and New Home Sales surge, too? "If I had a hammer, I'd hammer in the morning. I'd hammer in the evening, all over this land." The Weavers. Air compressors and nail guns are firing up across the country as Housing Starts surge. 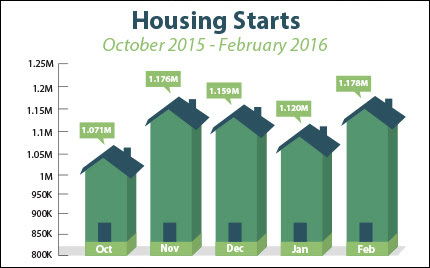 February Housing Starts were a whopping 30.9 percent above February 2015. Month-over-month Housing Starts also rose 5.2 percent from January 2016, above expectations. That means more people are breaking ground on new homes. Building Permits, a sign of future construction, came in at 1.167 million, below the 1.204 million expected and down from the 1.204 million in January. In other news, the Fed took a dovish stance to its monetary policy statement last week and opted to maintain low short-term interest rates to stimulate the economy. In a surprising move, the Fed also said it sees two hikes to its benchmark Fed Funds Rate this year, instead of the four they previously mentioned. The Fed noted that there is still room for improvement in our economy, plus there is concern about the global economy overall. One thing the Fed will be monitoring in the coming months is inflation. While there are no signs of inflation at the wholesale level, the Core Consumer Price Index (which excludes food and energy), came in at 2.3 percent from February 2015 to February 2016. This is the highest year-over-year reading in eight years! The Fed will be watching to see if this increase is a trend, and investors will be, too. Inflation reduces the value of fixed investments like Mortgage Bonds, and if it does creep into our economy it could be a bad sign for Bonds and home loan rates. The good news for homebuyers is that home loan rates remain near historic lows heading into spring buying season, which can help offset those monthly out-of-pocket expenses. If you or someone you know has any questions about the housing market, current rates or home loan products, please don't hesitate to email or call me. Housing data and Gross Domestic Product headline the week. Data kicks off with Existing Home Sales on Monday followed by New Home Sales on Wednesday. Durable Goods Orders will be delivered on Thursday along with weekly Initial Jobless Claims. On Friday, the final reading for fourth quarter 2015 Gross Domestic Product will be reported. Remember: Weak economic news normally causes money to flow out of Stocks and into Bonds, helping Bonds and home loan rates improve. In contrast, strong economic news normally has the opposite result. When you see these Bond prices moving higher, it means home loan rates are improving. When Bond prices are moving lower, home loan rates are getting worse.